A Quick Look: The hotel was earlier using an outdated legacy system that was complex and resulted in multiple errors. They faced many problems like losing important data and experiencing system crash. The system also required reloading on a regular basis. The only IT personnel in Fiji to service their software catered to larger hotels, which led to a long waiting period for the hotel. The hotel owner implemented Hotelogix cloud based PMS and saved on a lot of money. There was no fear of losing data and the errors in accounting were eliminated. Moreover, the hotel operations could be accessed from anywhere and at any time. 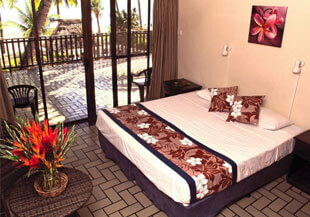 Aquarius On The Beach is a budget boutique hotel located right on the Wailoaloa Beach in Nadi, Fiji. The hotel is located only 15 minutes away from the Nadi International airport. The quaint family owned establishment takes great pride in giving their guests an enjoyable stay and provides the following facilities: restaurant, bar, taxi, tour desk and a shop. Previously the hotel used to use an old fashioned Legacy system which was extremely complicated and cumbersome due to which numerous errors were made, some deliberate and some hidden. Since the software was dependent on servers and extra IT infrastructure, the primary PC being used, used to lose data, crash and require reloading on a regular basis. Additional terminals increased the cost of the software. Support was another issue, in Fiji there was only one IT personnel who could service their software and he also catered to all the larger hotels in the vicinity, so whenever there was a service fault and the hotel needed assistance they needed to wait for a long time. Also the owner, Mr. Dale Hermanson always was keen to have a cloud–based PMS since he doesn’t reside in Nadi. PMS can run on multiple computers without a "per computer" rate being charged. Since the PMS is a cloud based solution, there is no fear of loss of data, errors in accounting and disruption in hotel operations due to a service fault. Fully integrated system – after switching over to the Hotelogix PMS, they started using Hotelogix’s POS for their restaurant and bar POS, switched from Siteminder to Hotelogix as their channel manager, and Xero as their accounting software. Hotel can be accessed from anywhere and at any time.